The tree is small to medium sized, reaching 8 to 18 m in height, with crooked trunk and spreading branches. The branchlets are glabrous or finely pubescent, 10-20 cm long, usually deciduous; the leaves simple, subsessile and closely set along branchlets, light green, resembling pinnate leaves.The flowers are greenish-yellow. The fruit is nearly spherical, light greenish yellow, quite smooth and hard on appearance, with 6 vertical stripes or furrows. Ripening in autumn, the berries are harvested by hand after climbing to upper branches bearing the fruits.The taste of Indian gooseberry is sour, bitter and astringent, and is quite fibrous. In India, it is common to eat gooseberries, steeped in salt water and turmeric, to make the sour fruits palatable. It contains numerous beneficial ingredients, which are mainly concentrated in the edible, plum-sized fruit it produces. Nellkai fruit, is one of the richest known sources of vitamin C - it contains 30 times the amount found in oranges. Taking Gooseberry juice with honey is good for improving eyesight. It improves nearsightedness and cataract. It reduces intraocular tension. 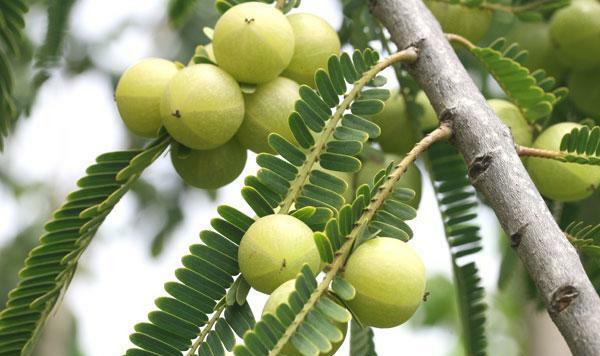 Indian Gooseberry or Amla stimulate the isolated group of cells that secrete the hormone insulin. Thus it reduces blood sugar in diabetic patient. Infection: Due t o its antibacterial and astringent attributes the Indian Gooseberry protects against infection. It improves body resistance. Diarrhea and dysentery: Due to its strong, cooling and laxative properties Gooseberry is useful for remedies for diarrhea and dysentery. It is a great relief for gastric syndrome and hyperchlorhydria (burning sensation in abdomen). Anti aging: Amla prevents health related hyperlipidaemia through attenuating oxidative stress in the ageing process. The fresh fruit contains more than 80% water, protein, minerals, carbohydrates and fiber. It is also used as remedies for fever, liver disorder, indigestion, anemia, urinary problems and respiratory problems. 1. Drinking fresh fruit juice daily helps to cure increased body heat, burning sensation of body, gastritis & digestive problems. 2. 20 ml of Amla juice daily with meals is an excellent liver tonic. 3. 1/2 to 1 teaspoon of dry fruit powder twice daily purifies blood. Cures Hyperacidity, wounds & ulcers. Haemoglobin, enhances immunity & acts as a powerful Antioxidant. 5. 20 ml of fruit juice with honey early morning improves eyesight. 6. 20 ml of Amla juice with 20 ml of Bitter gaurd juice daily helps to manage glucose level in Diabetics. 7. Massaging scalp with oil prepared with the dried fruit acts as a hair tonic & induce good sleep. 8. Checks th bad effect of ageing factors. 9. Very effective for in diabetic patients. 10. Enhances the physical and mental development. 11. Checks the unwanted greying & fallin of hair. 12. Control the blood pressure. 13. Gives the extra energy in pre & post natal periods. (specially in lactation period). 14. Increases the haemoglobin percentage in the blood. 15. An excelent blood purifier and increases the beauty of the body. 16. Specially useful in Skin diseases. 17. Amla is powerful food for the brain. The recommended dosage is 10 ml juice / 1 teaspoon powder taken twice a day at mealtimes. There are no known contraindications, but as always you should check with your practitioner before taking it. You can get pure Nellikai juice and powder at IKS Academy Centre in Kuala Lumpur, Malaysia. nice site and theme.. I love ancient India and love to see it alive someday in the present. Keep up! Nowadays some 25% of the people started taking nellikai juice...i am seeing benefits out of it. What is the right time to consume the fresh Nellikai in the Dya time apart from the early morning.